Last week, Oscar went to the veterinarian because we noticed some brown discoloration and light scabbing on his skin. Oscar was diagnosed with a skin infection, given an oral antibiotic, and sent home. Despite his skin infection, Oscar was completely fine and acting like his normal, spunky self. On Sunday, Oscar woke up later than usual and wasn’t excited to get up like he normally is. He ate his breakfast and then settled down and took a nap. He normally wanders around the house for a while in the mornings looking for crumbs and doing a general sweep of the house, but on Sunday he napped instead. We noticed the difference in his behavior but just figured he was more tired than usual. A few hours later, I went to the fridge and opened up the carrot bag, but Oscar didn’t budge. Since Oscar always runs into the kitchen when someone opens the carrot bag, I knew something was wrong. I kept a close eye on him for the next few hours and made sure he would still eat when we brought him food and treats. When I settled down next to him to cuddle, I realized his body was much warmer than usual. I didn’t have a thermometer to take his temperature, but I knew it wasn’t normal for him to be that warm. Now I was worried that he had a fever but didn’t have a way to know for sure. 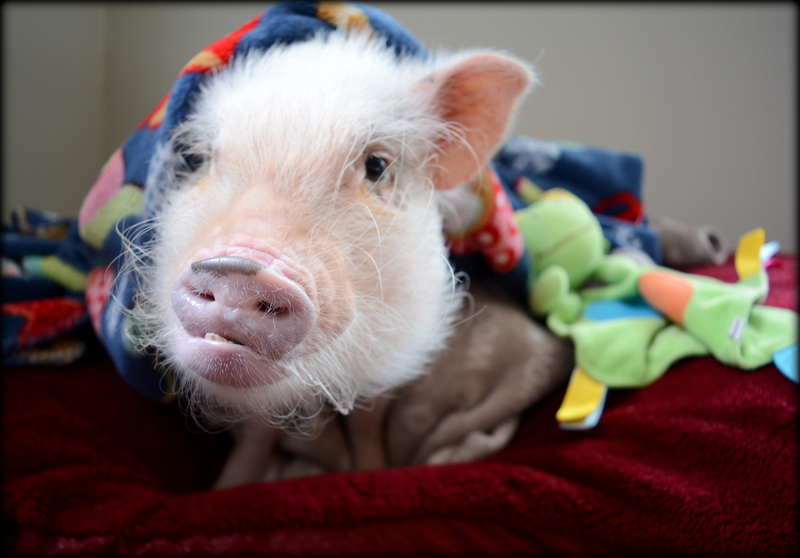 I am terrified of Oscar getting mini pig pneumonia, so I started to panic once I realized he had a fever. I found some online resources that listed specific temperature ranges to check for, but we didn’t have a thermometer anywhere in the house. I would have called our veterinarian, but it was Sunday and the vet was closed. I figured I was probably okay waiting until morning and calling our vet right away for an appointment, but I wasn’t completely positive Oscar would be okay for that long. I kept making sure Oscar was eating and drinking, but I felt helpless because I didn’t really know what to do. Although I know better, I have procrastinated on putting together an emergency plan for Oscar because it can be difficult and because I don’t want to think about the worst possible scenarios. With our dog, it’s easy to find an emergency veterinarian at a moment’s notice where I feel confident she will get good care. With Oscar, regular veterinarians capable of providing care for mini pigs are hard enough to find, let alone emergency vets. Although we can likely find an emergency vet willing to help, I’m just as scared of not finding a mini pig vet as I am of finding one willing to try but not trained or experienced with mini pigs. So, there I was on a Sunday night panicking that I could so quickly lose this pig that I love dearly. I always imagined that if an emergency popped up, I would use my online resources to quickly find a vet and the tools I need to help Oscar. Instead, I had no thermometer to even take Oscar’s temperature, and I was a complete mess. I was so scared and worried that I was nauseous and couldn’t think straight. I had no idea who to call and needed to take action but didn’t know what to do and was afraid to leave Oscar’s side. Fortunately, my more cool and collected husband picked up the phone and started calling around to emergency vets to find someone who could help us. The emergency vet clinics, however, didn’t know of any mini pig vets who were available until the next morning, so we were stuck. We put Oscar in our bed so that we could check on him throughout the night, and by morning he seemed to be feeling a little better. We still aren’t in the clear and have a vet appointment for him today, but he’s eating well and is up and moving around much more than yesterday. I think Oscar is going to be okay, but we lucked out and I learned an important lesson. Although it’s difficult to think about emergencies, it’s important to have a plan and supplies ready. I thought I would be able to have a clear head and handle an emergency situation when it happened, but I couldn’t. I was more emotional and unable to make decisions than I ever imagined, and I needed to have supplies and a list of steps ready so that I didn’t have to make decisions when I was upset and panicked. 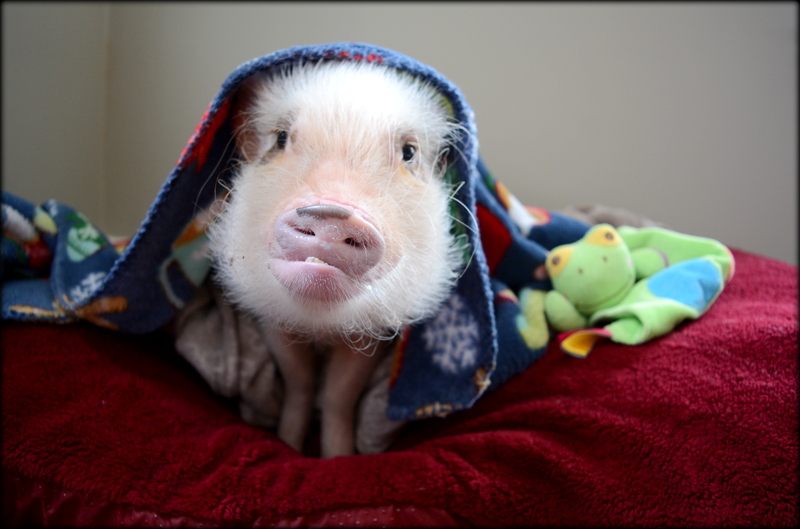 Thanks to Mini Pig Info, preparing for an emergency with your mini pig is easy. Their website has a list of emergency supplies to keep on hand and also phone numbers and websites to write down for when you need them in a moment’s notice. I highly recommend going through this list and not waiting until your mini pig is sick or injured to take action. I wasn’t ready, and it made a scary situation worse and could have harmed Oscar. After our scare this weekend, I plan on making an emergency supply kit for Oscar with the phone numbers of his regular vet and an emergency vet, along with web addresses for emergency help and advice. An emergency may never happen, but it’s important that I’m prepared to help Oscar if it does. One of the toughest parts about being a mini pig parent is not having resources and veterinarians readily available, so it’s important that we take action early and know where to go for help when we need it most. Update: We made it back from the veterinarian, and Oscar should be okay! His temperature is back to normal, and he isn’t showing any signs of congestion. The vet recommended that we get a thermometer and take his temperature if we notice any unusual behavior or if he feels warm, so we’re going to keep a close eye on him for a while and watch for any abnormal behavior or symptoms. The vet thinks he was feeling sick to his stomach from the antibiotics he started taking last week and that he should be better very soon! We’re so relieved! OH EM GEEEE! This is literally an encounter of our weekend with Hamlet! But the roles were reversed…My husband was the one panicking and I was the calm one. But everything else was like you were typing from my mind! Fever, moping, eating and drinking fine, brown “pig rust” discolorations, scabbing! After no available emergency vets (and yes you’re right…hard enough to find a regular vet for Hamlet) I spent massive amounts of time on the internet and concluded that Hamlet had a slight piggie sunburn. He’s back to his normal self today but still has an appointment tomorrow so I’ll keep y’all updated! Oh no…poor Hamlet! Good for you for being the calm one; I was a disaster! It’s so frustrating not being able to find help and answers for these little guys. I kept trying to look things up on the Internet and just got more and more scared, which is when my husband cut me off and started calling emergency vets (thank goodness for him). SO glad Hamlet is back to his normal self today and has a checkup scheduled. Definitely keep us updated when you get the chance! When it’s hard to find good info, sharing experiences is so helpful for us other mini pig owners to hear about. Good luck tomorrow! Hope Hamlet stays feeling well! Ok so first things first…Hammie got a clean bill of health yay! Now on to his ailment…his fever and moping was caused by teething (duhhhh I’m a mother of 7…how could I miss that one?) Vet recommended Children’s Tylenol if he has those symptoms again. Phewwwwww…no mites which was literally my worst fear! Got some ear cleaner because he has a bit of a buildup in there and was told to add some hay to his diet to help with his digestion (he currently doesn’t have any problems that I’ve noticed and is very regular with his bathroom schedule but doc said he felt a bit bloated). Sorry for the long ramble but wanted to share our entire experience JIC something helped someone! Thank you for following up and sharing that! It’s so helpful for other pig owners to hear what’s going on in case they have a similar situation! I’ve actually wondered about teething and fevers myself, so that’s really interesting to hear. Good to know there are options for really bad teething since it’s such a common issue for pigs. Glad everything turned out well and that Hammie didn’t have any mites. I checked out his picture on Facebook, and he’s absolutely adorable! I looooove that he wore his bow tie to the vet! 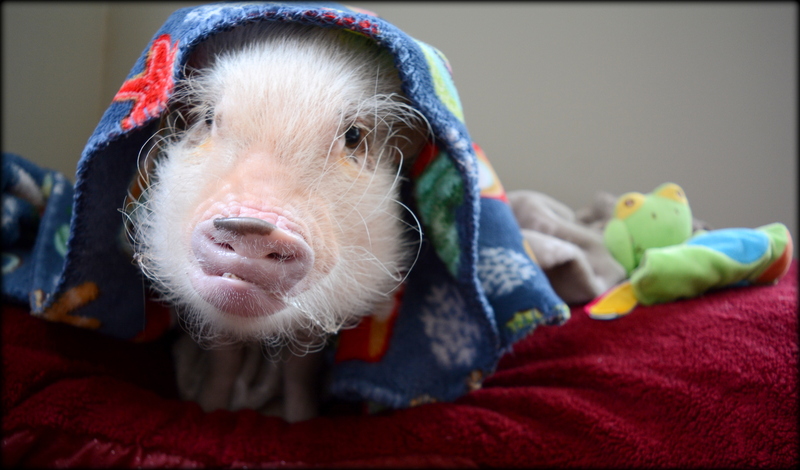 His little baby snout is just the cutest. Thanks for taking the time to share the outcome at your vet because I know it will be helpful for others (and me)! Thank you! We’re back from the vet, and his temperature is normal and everything checked out okay. She thinks it was an upset tummy from the antibiotics he’s on right now. We’re going to get a thermometer and watch his temperature for a while while keeping an eye out for any unusual symptoms, but he should be okay. We’re so relieved everything turned out okay! I’m glad Oscar is okay. That’s for sure a bad sign when they don’t want to eat, as pigs LOVE food. Probably dream about it. I know I would probably panic and freak out if anything happened to my piggy. I am lucky I have 2 vets in my area who treat mini pigs. One of them does house calls, so that’s good to know should anything happen. Thank you! He is back to normal today, so we’re still just really relieved. I panic at the smallest sign of him not wanting food, and I agree that they probably even dream about food! That’s awesome that you have a vet in your area who does house calls. I hadn’t even thought to ask our vet about that, but it’s worth checking. I’m always a little concerned about dogs in the lobby area, and it would be nice to have a home option in case of sickness or emergency. Thanks for mentioning that because it’s worth people checking to see if that’s an option for them. I know I’ll ask ours next time we’re there! Oh, and that minipiginfo site is very helpful. I was reading the section about their scent glands and come to find out that those line of bumps on the back side of my pig’s front legs are scent glands…haha. There’s a residue that builds up in them and he loves when I pick at them. I just thought it was funny. You should see if Oscar likes it, too. That site is great! It’s really helpful when I need to know details about their health or care or I’m panicking about something and need a solid resource. I haven’t ever looked for Oscar’s scent glands on the back of his front legs, but I’m definitely going to check it out when he’s napping next. Now I’m really curios to see if he likes it! I bet he will…he’ll take almost any kind of rub or scratch. Thanks for mentioning that; I’m super curious now!